Home / App / Application / cashback / gopaisa / Review / Website / Earn CashBack While Shoping Online With GoPaisa. Earn CashBack While Shoping Online With GoPaisa. Gopaisa is not a new name in market. It was incorporated in 2012 by Aman and Ankita Jain to precisely target the basic instinct of an Indian shopper. Being a disruptive force in the marketing space, the company helps in putting the money back in the consumers' pockets by way of "Cashback". Online Shopping and Cashback is an addictive trend going viral these days. It is too convenient to get everything in your laptop, gopaisa has gone. The application is a light weight application with an attractive user interface enhancing the user experience. It’s an platform that gives the information about all the offers that are currently running on the online shopping websites along with the promocodes with the Highest Discounts. That’s not enough, the best thing is that it provides you some cashback for every purchase that you make. You get to earn assured cashback for shopping at your favorite online stores on the go. With GoPaisa you earn cashback on top of all coupon discounts, offers, deals and also wallet cashback discounts & coupons. 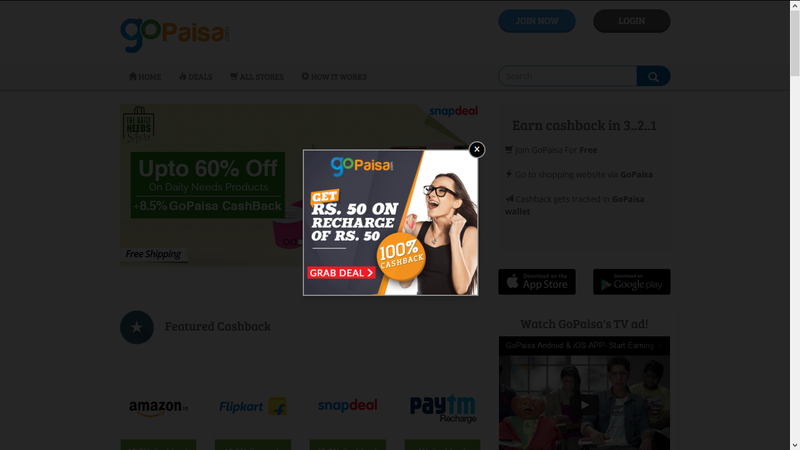 GoPaisa offers cashback when you shop at the top online retail stores of India like Paytm, Flipkart, Snapdeal, Amazon, and Ebay, or recharge your phone, or order food from Dominos, Foodpanda and even for ordering everyday groceries or cab booking. In total you get discounts at over 450+ online stores. 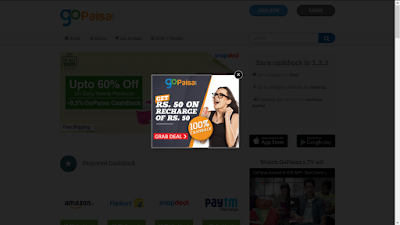 GoPaisa finds all the best buy one get one free offers, best recharge deals with cashbacks, limited period offers, up to 90% off hot deals and discounts for shoppers in India. You can choose to withdraw money collected in GoPaisa account as the way you like. You can redeem your cashback for Free mobile recharges, Free Paytm wallet transfers, Free DTH recharges, E-vouchers for popular stores like Amazon, Flipkart etc and even for direct Bank transfer and this list is ever expanding as we keep on adding new redemption partners every day. It also gives you cashback for reffering your friends. GoPaisa lists the top online stores for a great shopping experience. Apart from the top online shopping websites of India like Paytm, Flipkart and Snapdeal stores like Shopclues which are making a good user base in India are also listed in GoPaisa so that people can earn cashback from their favourite online shops and choose from among the wide variety of products and also getting hot deals and best offers at the same time. Apart from this, people can choose from various food portals like Foodpanda and Dominos, book their favourite hotels and flights from MakeMytrip and Yatra, buy the latest fashion items and accessories from Jabong and Trendin, choose from among the latest gadgets from Amazon and Ebay, household items from Pepperfry and HomeShop18; and medical and fitness products on 1mg and Healthkart. An amazing application that brings offers that are too tempting to resist.